This book has been on my list of books to read for quite a long time. I finally got around to it. 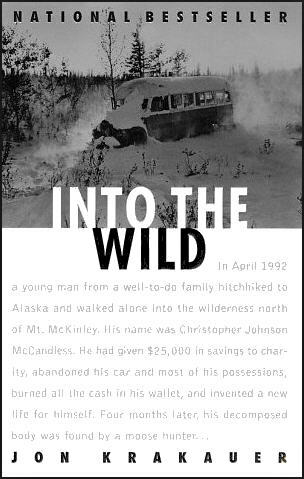 For those who do not know the premise of the book, it is the true story of Chris McCandless, a young man who decided to journey into the wilderness of Alaska alone and ended up dying of starvation. It’s a powerful story and extremely well-written. I found it difficult to put down. In the book, Krakauer uses journal entries, letters, photos, and interviews to piece together the events of Chris’ odyssey into the wild, which he undertook immediately upon graduating college and did not inform his friends or family about. He basically severed his ties to society and decided to live on the fringe. In a letter he wrote to Ron Franz, a person he met while traveling, he expresses his belief in the importance of living an adventurous life. I’d like to repeat the advice I gave you before, in that I think you really should make a radical change in your lifestyle and begin to boldly do things which you may previously never have thought of doing, or been too hesitant to attempt. So many people live within unhappy circumstances and yet will not take the initiative to change their situation because they are conditioned to a life of security, conformity, and conservatism, all of which may appear to give one peace of mind, but in reality nothing is more damaging to the adventurous spirit within a man than a secure future. The basic core of a man’s living spirit is his passion for adventure. The joy of life comes from our encounters with new experiences, and hence there is no greater joy than to have an endlessly changing horizon, for each day to have a new and different sun. If you want to get more out of life, Ron, you must lose your inclination for monotonous security and adopt a helter-skelter style of life that will at first appear to you to be crazy. But once you become accustomed to such a life you will see its full meaning and its incredible beauty. Throughout the book, Krakauer includes quotes from writers regarding experiences in the wilderness. One of these quotes really struck me. Wilderness appealed to those bored or disgusted with man and his works. It not only offered an escape from society but also was an ideal stage for the Romantic individual to exercise the cult that he frequently made of his own soul. The solitude and total freedom of the wilderness created a perfect setting for either melancholy or exaltation. I have always found the wilderness to be a powerful symbol for the dark, primordial realm of the subconscious mind. That, combined with the fact that much of America was wilderness for a long time, the symbol of wilderness has become part of the American collective consciousness. It is the wild, unexplored part of ourselves that always seems to lure us. McCandless traveled around the United States for about two years before finally heading out into the Alaskan bush. There is a great journal entry that describes his feeling as he finally found his solitude in the wilderness. Two years he walks the earth. No phone, no pool, no pets, no cigarettes. Ultimate freedom. An extremist. An aesthetic voyager whose home is the road. Escaped from Atlanta. Thou shalt not return, ‘cause “the west is the best.” And now after two rambling years comes the final and greatest adventure. The climactic battle to kill the false being within and victoriously conclude the spiritual revolution. Ten days and nights of freight trains and hitchhiking bring him to the great white north, no longer to be poisoned by civilization he flees, and walks alone upon the land to become lost in the wild. For my entire life, I always believed that burning had to be the worst way to die, and while I still think that it is probably the worst, after reading the description of what happens to a person who starves to death, I believe that this is a close second. Starvation is not a pleasant way to expire. In advanced stages of famine, as the body begins to consume itself, the victim suffers muscle pain, heart disturbances, loss of hair, dizziness, shortness of breath, extreme sensitivity to cold, physical and mental exhaustion. The skin becomes discolored. In the absence of key nutrients, a severe chemical imbalance develops in the brain, inducing convulsions and hallucinations. Some people who have been brought back from the edge of starvation, though, report that near the end the hunger vanishes, the terrible pain dissolves, and the suffering is replaced by a sublime euphoria, a sense of calm accompanied by transcendent mental clarity. It would be nice to think McCandless experienced a similar rapture. In my younger days, I took a lot of risks and had some pretty close calls. I suppose that is why I related to this book. I could see myself in Chris McCandless. I share his romantic idealism, the longing to live a full life, the reverence of nature, and the love of literature. I am pleased to have caught your review Jeff as I had been waiting to read what you thought of the book. So true what you say about the wilderness being symbolic for the wild, unexplored territories of the mind. I hadn’t realized the book contained quotes as you explain here. Were there detailed descriptions of Alaska in the book and the animals there? Also, did you find it overall sad in nature or a mix of sadness and a sense of freedom? Hi Christy. I just watched “Into The Woods” so I have the wilderness/woods/subconscious connection at the forefront of my thoughts. Yes, there were some great descriptions of Alaska (on my bucket list to visit there), and there was definitely a mix of sadness with freedom/adventure. I’m glad you liked the review and as always, thank you for taking the time to comment. How interesting. I love the quotes you included here. I too think of the wilderness as symbolizing an unknown part of our own psyches. The quote by Nash was particularly interesting, the idea that our desire to escape into the wilderness may be to exercise the “cult” we make of our souls, to experience the melancholy or euphoric. Not an attractive depiction, but possibly some truth there. I saw the movie based on the book and really enjoyed it. Bummer ending though! Hope you are having a wonderful holiday season, and thank you for taking the time to leave such a thoughtful comment.